The Invisible Man was an extremely popular science-fiction novella, first published back in the early 1800’s, and while the work isn’t as popular today as it once was, Net Entertainment have ensured that at least some reference can be found in modern-day society. That’s because their exclusive Video Slot – The Invisible Man – is based all around the book (and the subsequent film made later on in 1933), with the slot closely mimicking the storyline, following the life of a mad scientist, who spends his days experimenting how he can become invisible. While Net Entertainment took a risk by choosing a book that most slot players wouldn’t have heard of, let alone read, some of their other popular titles that’re based on old material, such as Creature of the Black Lagoon, have done incredibly well, so it’s a wise move from Net Entertainment to cash-in on a – generally – otherwise untapped niche. The Invisible Man Video Slot is fast-paced, fun (albeit very frustrating at times), and can offer decent wins in both the base-game and the features, so it’s no surprise that it’s become one of the software providers more popular titles. With action available from as little as 20p per spin, right up to the max of £100 a spin, players can customize all aspects of their gaming experience, adjusting both the coin value, and the coin bet per line, ensuring an affordable stake amount is always achievable. The two wilds; Policeman Wilds, and The Invisible Man Wilds, both can appear anywhere on the screen. They each have a “home”, and The Invisible Man Wild’s “home” is the left-hand-side of the reels, while the Policeman Wild’s “home” is the right-hand-side of the reels. Confused? Think of it like a boxing ring – each player has their corner, and will return to it after every bout. Anyway, each time you land a wild, you’ll then be awarded a re-spin, with the wild moving one reel closer to home each spin. 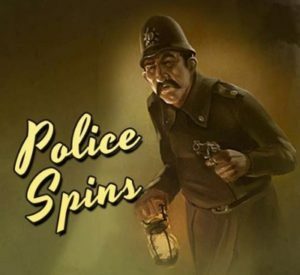 So, for instance, if you landed a Policeman Wild on reel one, you’d get 5 free-spins, as it makes its way to the right-hand-side of the screen. Multiple wilds can appear at once, and land two or three tougher to be in with a great shot at winning big. 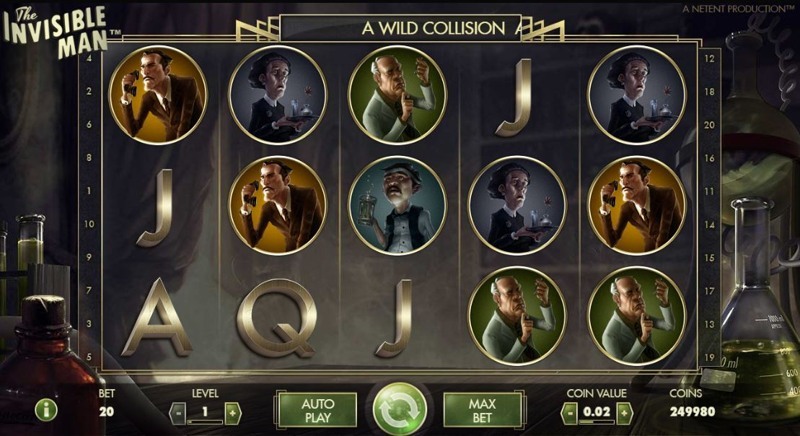 In order to trigger the free-spins round, you need to collide the two different wilds together. This means, for instance, you’d need a Policeman Wild, and The Invisible Man Wild both on the middle row, in a position that ensures they “crash” into one another. When this happens, you’ll be awarded ten free-spins, and you’ll then notice two meters at the top of your screen appear; a Policeman Wild meter, and a The Invisible Man Wild meter. 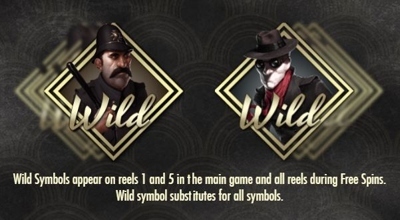 Each meter fills up when the relevant wild symbols land, and if you manage to fill an entire meter, you’ll then get to play a special bonus-round, details of which can be found below. 3 free-spins with the Policeman shooting 5 wild symbols onto the reels before each spin from his gun. The Invisible Man Bonus-Round – A “pick me” bonus, where you advance through three stages clicking items in a variety of settings. Cash prizes, multipliers, and “end” are the three different picks you’ll find.